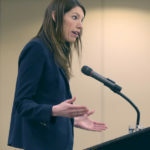 That ’s what we heard from State Rep. Kathleen Clyde (Kent) when she spoke to the Akron Press Club on Monday, April 9. She covered the full range of suppressive initiatives forever denied by the oppressors. These initiatives were enacted most recently by Jon Husted, who is leaving the position of Ohio Secretary of State to tag with Attorney General Mike DeWine, who has decided to add the governorship to his historically long list of political offices. That was her piercing stroke summarizing years of Husted’s pious tinkering with the electoral system, from changes in voting hours, voter eligibility, a ban on 17-year-olds voting in primaries even though the law enables them to vote in the general election if they reach 18 by Election Day, mishandled voter purges and so much more. The deceptive battle cry nationally and in Ohio was that voter fraud threatened the outcome of races. Ha! You may recall that even the fellow in the Oval Office cried that he would have won the popular vote if millions of ineligible voters hadn’t voted for Hillary Clinton (tee-hee). He even went so far as to gin up a voter fraud commission that quickly collapsed for lack of evidence. In the coming months towards the November elections you’ll be hearing a lot about the fraud plot and all sorts of other reasons why Husted was only doing his noble duty as Secretary of State – to rearrange the system, often to the refrain of cheering sections on editorial pages. But I’ll be watching how Clyde’s Republican opponent, State Sen. Frank LaRose (Hudson) will try to defend his party’s tailor-made system to elections. He’s said to be a party favorite in Trump/Ohio as one of the President’s earliest surrogates and the campaign money is gushing to provide him everything he needs to prove that there is no voter oppression in Ohio. In this words, even one fraudulent vote is too much. You can see where he’s headed against Kathleen Clyde.